On the banks of the Bull River, just west of Noxon, Montana. This beautiful mountain getaway, is located on a 10 acre plot that is surrounded by thousands of acres of national forest service land offering wildlife galore and unlimited recreational opportunities. The Cabinet Mountains offer a spectacular backdrop as we sip our morning coffee on the west-facing deck. 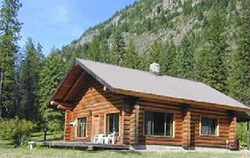 Fish the river, hike the mountains, or just relax on the deck and enjoy the beautiful scenery and clean mountain air. The charming log home has 2 bedrooms, one bath and can sleep six easily. It's a spectacular 2 hour and 15 minute drive from the airport in either Missoula, Montana or Spokane, Washington. The house is fully furnished including a complete kitchen. Trout fishing is just 200 yards away in the Bull River. Full kitchen, washer/dryer, woodstove, outside deck and patio, furniture, BBQ grill, 1 Queen bed, 4 twins (sleeps 6), linens provided, VCR/DVD player, telephone, microwave, coffeemaker, cooking utensils. Other activities nearby include: skiing (Schweitzer Mountain); biking, hiking, wildlife viewing (deer, elk, bear, eagles, moose, etc. ), boating, waterskiing, snowmobiling, fishing. 120 miles from Glacier National Park and just 30 miles from Lake Pend Oreille - voted one of the most beautiful lakes in America. Directions: The cabin is located in Northwest Montana off of Highway 200 between Noxon and Heron. Sixty miles from Sandpoint, Idaho. Fly into Missoula, Montana or Spokane, Washington, both are about a 2 hour and 15 minute drive. Exact directions provided upon reservation.